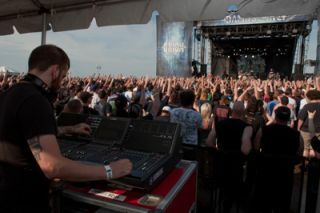 Bader Field in Atlantic City over a recent summer weekend was the site for the Orion Music + More Festival featuring Metallica on the main stage along with 30+ bands and over 33,000 in attendance on each of the two-days. ACIR Professional provided the Yamaha CL5 Digital Console and two Yamaha PM5Ds for the Damage Inc stage along with ten Yamaha TX3n amps for monitors. The Damage Inc stage featured performances by Suicidal Tendencies, Sepultura, The Black Dahlia Murder, Torche, Letlive, Red Fang, Kyng, Landine Marathon, Black Tusk, and They Will Be Done. The front of house engineers for the acts got their mixing hands on the new CL console, with Yamaha and ACIR staff on hand to answer any questions. ACIR Professional also provided a Yamaha LS9-32 with eight Yamaha DSR 15 speakers and eight DSR subs for Rob Trujillo, the bass player of Metallica, for use on the Vans stage.